My name is Peter Nowlan and I have been sharpening knives by hand for many many years and throughout my sharpening journey I have learned much, much of that from the mistakes that I have made. 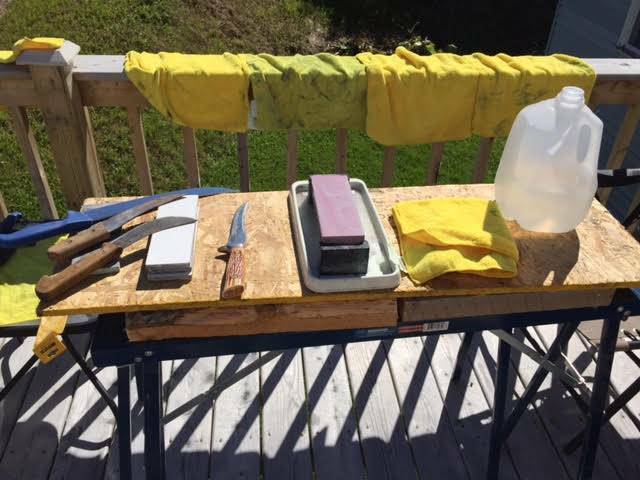 A recent trip I took sparked a thought, it hit home, this is not so much a tutorial on how to sharpen a knife, I have already done that, the purpose of this article is to hopefully make that startup process even easier for those who wish to learn. It is my very firm belief that at some point in a persons life, the desire to sharpen something with an edge will become a reality and they will give it a shot. Most will just grab whatever is available and attempt to grind an edge on a blade without any real knowledge of what is involved, we just have this urge and in many cases, a need, to make something sharp. In my case, almost 40 years ago, I had that urge and I started gathering knives to sharpen but I had no idea of what the process involved, I was just mimicking, or trying to mimic what I saw my father doing to his chisels and other tools. Keep it simple: you don’t need much to sharpen a knife. I cannot count how many people have told me about their own sharpening experiences, and in almost every case it was a short lived idea but the point is, they had the urge to attempt it and they tried it. Some of us do it because it is cool, we love knives so it only makes sense to follow in the steps of our forefathers and sharpen them. Many people sharpen a knife because it is necessary, there is not joy to the process but there is a need. 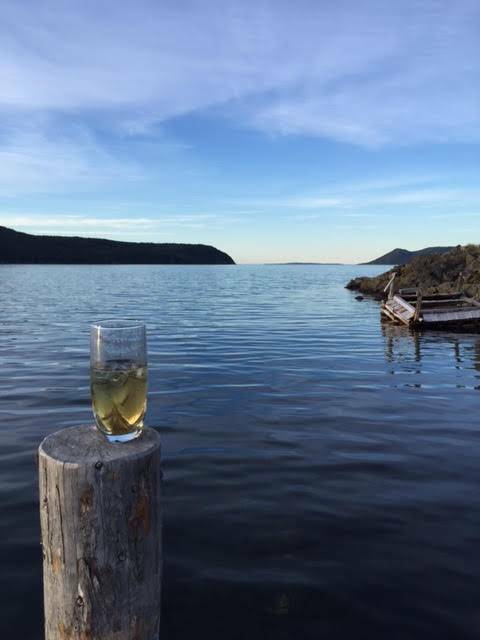 If you don’t believe that, visit some of the small fishing communities in Newfoundland and talk to the men who fish to survive and clean their fish daily and in most cases with knives that are barely sharp but it’s the best that they can do. 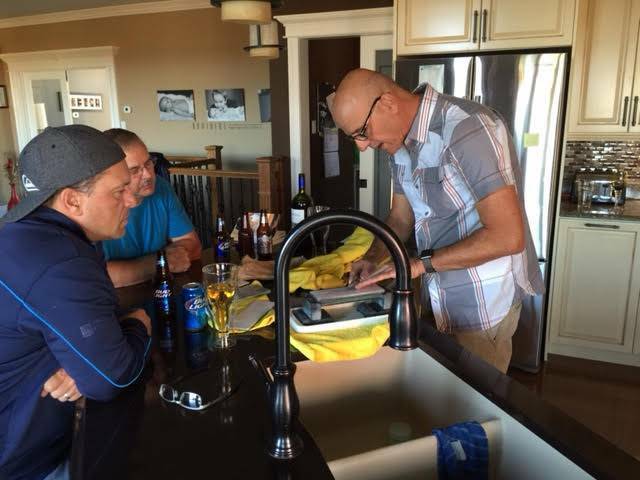 They understand the importance of a sharp knife and enjoy it, but they don’t, in many many cases understand the process of making a knife sharp, sharp enough to make their lives easier. Part of this of course is that as I said, sharpening a knife is a necessity, not a passion. Like mowing the lawn, we do it because the grass is too long, we don’t usually care about the lawnmower, we don’t think about it at night, not beyond the point of keeping gas and oil in it. This visit to these small communities made me think of something, made me realize that sharpening a knife doesn’t have to be complicated and involve a lot of accessories at all. I think that there are so many products out there and so many folks selling and pushing their products that it could generate a sense of doubt, “If I don’t have this, my knives won’t reach their full sharpness potential” I do understand of course the need to sell these items, we do need many but not to get started, just a few basics. I only say this because it happened to me, I felt a requirement to own every possible sharpening item that I could get my hands on, items beyond a few water stones that is. Strops and sprays and more strops and sprays for example, each laden with an increasing level of refinement up to ridiculously high levels, 64,000 grit and up. In addition there are so many brands of water stones and their wide variety of grits that selecting the right ones can be daunting to a newcomer. I ended up accumulating just about every stone, strop and spray for the strops that I could get my hands on, thinking at the time that these items would make me a better sharpener. Now after 10 years and thousands of knives I know that these things didn’t make me a good sharpener, an understanding of the process of knife sharpening, a basic knowledge of steel and countless hours of practice using a very basic setup is what helped me the most. In no way am I suggesting that any sharpening accessory is a waste of money, all I hope to achieve here is to guide novice sharpeners in a direction that leads them to become better knife sharpeners and to alleviate any pressure created by a sense of requirement gained from watching videos or believing every word written on their favourite forums. Consider this, 40 years ago I watched my father sharpen a chisel on a single oilstone and then take that tool to wood and watch it curl up as he sliced layers off the top and chisel going through the wood beautifully. If he, and your elders could do this, we can do it without too much fuss, we need to prioritize and step off on our journey in the right direction. I didn’t, I took the long way but I learned some things on that route. The best advice that I can offer is to keep it simple, focus on gathering three Japanese Water Stones, perhaps not all at once but set your goal for three. Don’t worry about strops and diamond sprays for them and such, if you feel the need to explore that path then do it later. Everyone is fascinated by the process of sharpening. Here are my 9 tips to get started, and to keep it simple. 2. Gain a fundamental knowledge of steel. I mean it, it is really important. It is the one thing I wish I had of done better, sooner, i.e. get that knowledge. It is easy for me to make the excuse that when I started there was no computers, so no YouTube or Google but that’s a feeble excuse. This is something that is going to hold you up, this is all part of the package, trust me when I say that your knowledge of steel will make you a better, smarter sharpener. I am not suggesting you need to know the metallurgical properties of every type of steel use in knives, just the basics, what is Carbon and Vanadium and what’s the difference between 56 and 62 in terms of steel hardness. Not just what the difference is but more importantly, how do those numbers impact your sharpening? All this info is very easy to find and knowing this will build layers of confidence and you need that. 8. Educate yourself, also read the book “An Edge in the Kitchen” by Chad Ward and gather a basic understating of steel. 3. Understand Angles. Know that Angles are important yes but not the actual number, such as 15 degrees per side but that building up of ability to hold an angle while you sharpen. CONSISTENCY is the single most positive contributor to sharpening success. Consistency is a reward that you achieve as you Practice, and as your Passion builds, as you pass the test of Patience and your Persistence pays off. Muscle memory develops as you practice and it is this muscle memory that will give you the consistency that will eventually propel you beyond your sharpening dreams. Start the sharpening process by focusing on holding the knife correctly at one angle and choose an angle that is most appropriate for your knife. A sharpening angle of 20 degrees per side is a good choice for most European knives, most soft knives, the knives most of use every day. 4. Know your Knife. Know at least if it is hard or soft steel and again this is easy to find and was probably a determining factor into you purchasing it. Be aware of your blade and see if it straight or slightly bent at the tip of is poorly ground and as you forward think the process, determine how you will work around any imperfections and understand that if you don’t work about them it will impact negatively, perhaps, the results. 5. Find YOUR sharpening technique. Find a sharpening technique that not just works, obviously, but one that you can repeat over and over and be comfortable and without distractions. I sharpen standing up and in part of my house where I am usually the sole occupant, it is just me and my knives and the products I used. Have a good source of light and water, whether it be from a water bottle or a tap. Find a very good stone holder, something that remains steady as you work, otherwise it’s shifting will distract you. As for a technique, I changed mine about three or four times. You may find a video of someone sharpening that you like, so try it out. 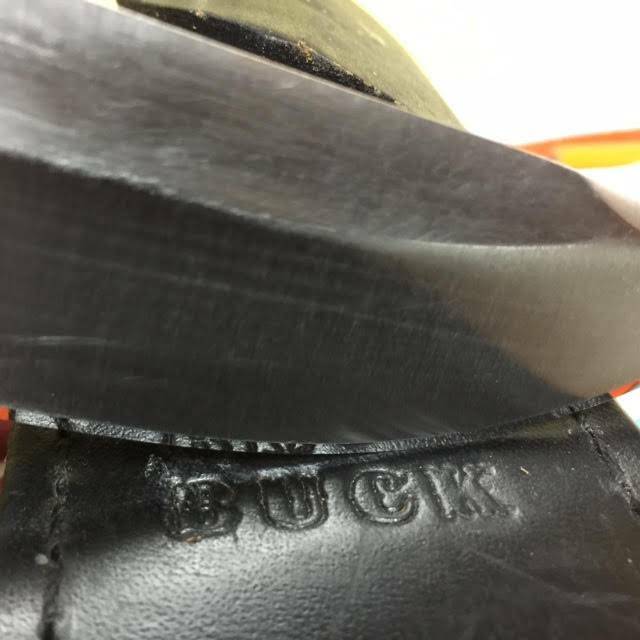 Decide whether you will use Edge Trailing Strokes or Edge Leading strokes (either work), the point is to get the search of the technique finalized so you can focus on sharpening, not how to stand or how to hold the knife, that is all part of it yes but get this all down soon. I use Edge Trailing strokes and one of videos I found are made by Mr. Jon Broida of Japanese Knife Imports. Jon is a man that I have much respect for, an accomplished sharpener and a person eager to share information. You may find someone else, I have videos as well but don’t watch too many, find some you enjoy and learn. 6. Get the right equipment, avoid going cheap. Japanese Water Stones are obviously the heart and soul of your sharpening and you will learn to develop a love and perhaps, like me, an obsession for them. I understand that is a lot of fun researching water stones and it is important to know which ones are the best and which ones work and which ones you should avoid. The only ones that I would avoid are ones without brand names and especially those ones you can find at a hardware store for $8.75. These are not good stones and learning on them, attempting to that is, is setting yourself up for failure. (As is learning to sharpen a knife using a cheap knife, don’t do that, get a decent knife to learn on). I used to think that in order to get the knife sharper, I simply needed finer water stones, if I could get the knife sharp at 1,000 grit, imagine what I could do with a 15,000 grit stone?, and following on from that, what if I had a 164, 000 diamond spray and leather from some exotic animal, there was no limit. This is wrong by the way folks. The whole point of this article is to encourage you to keep it simple, sharpening is not complicated. So focus on three water stones, whether they are King, Naniwa, Shapton or Kotetsu, start with a Medium stone at the 1,000 grit level and then move laterally bin grit to Coarse and Fine. So a good combo is 400, 1,000 and 5,000 for example. Your knowledge of steel will make you understand that you don’t need to finish your $80.00 Henckels at 8,000 grit and in fact you shouldn’t. IN FACT, a 1,000 grit finish is all you need. You need to make one more purchase and that is a good stone flattener. I use Atoma plates to keep my stones flat, there are less expensive options and again, it is something you need to research but not having a flattener from the start is going to hurt you before too long, especially with coarse stones, they all dish more quickly. As long as you are aware that you need something, some people use drywall mesh, just know that you need a flattening plan. 7. Take a sharpening lesson if you can, if it is available. I do private lessons only (check this page) and the information that I pass along is just what folks need to get started, to create an edge sharper than they have ever seen. An Instructor’s job is to get you started in the right direction, to educate and motivate you into continuing on your own. So find a person who does this and I don’t mean your neighbour with a grinder out his shed who can show you how to sharpen a knife for free. I wish I had a water stone for every time I got a knife to sharpen from a customer who listened to the neighbour. 8. Understand pressure. Understand pressure and how it impacts your sharpening results, I have written an article on this subject here. I consider the manipulation of pressure an extremely beneficial act in regards to sharp knives, learning to get the most out of every water stone I use by adjusting pressure has the most dramatic results over any other aspect of my own sharpening process. 9. Manage your expectations. Don’t be afraid to walk away from a knife and come back to it. As I have said many times, keep it simple, gain an understanding of the process by reading or watching and then practice. You need to remove fatigued metal from Side A and Side B and then bring those two sides of the blade together as precisely as humanly possible at the Apex of the knife, that’s all there is to it. Your own measure of precision will grow and grow, the more you practice, the faster it will grow and sharper you knives will be because you will gain consistency. Passion is huge part of it, you need to enjoy what you are doing. Enjoy the process. Sharpening knives is fun! 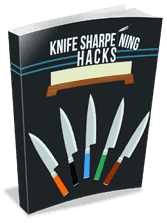 You can learn to sharpen a knife for less that $100.00, easily. Don’t think you need to go out and buy everything at once, you don’t even need to buy the most important component of your sharpening journey: Knowledge, it is out there, it is low hanging fruit and the more you eat the smarter you get.